The NMA’s venerable National Speed Trap Exchange has been given a dramatic facelift. 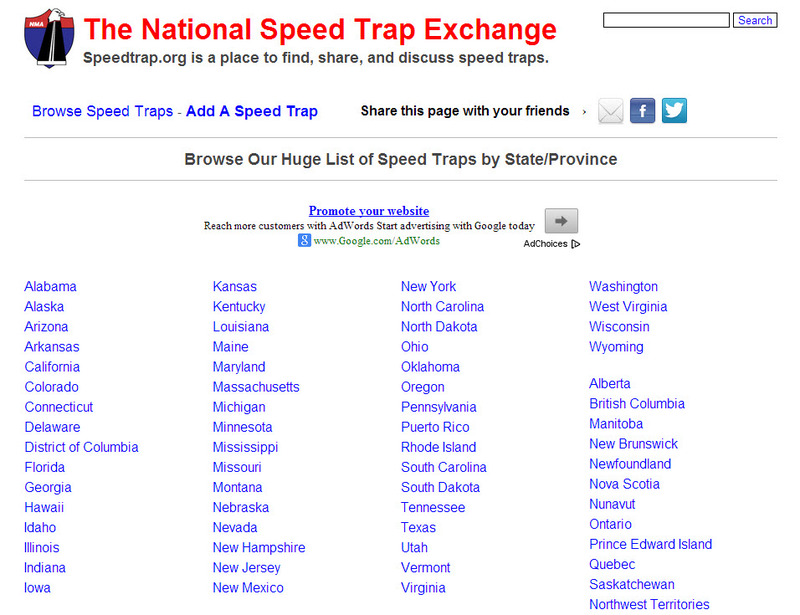 From its inception in 2000, the Exchange at www.speedtrap.org has been a popular online destination for highway travelers. Over these past 13 years, motorists have reported over 80,000 speed trap locations with descriptive information that help fellow drivers understand the cat-and-mouse tactics used by law enforcement at those chronic ticketing spots. Even popular websites need to be freshened periodically to keep visitation rates strong. Before the current revisions, the Exchange remained the second most visited destination among NMA websites. Only the NMA Blog (http://blog.motorists.org/), with new content posted five days a week, draws more traffic on a regular basis. 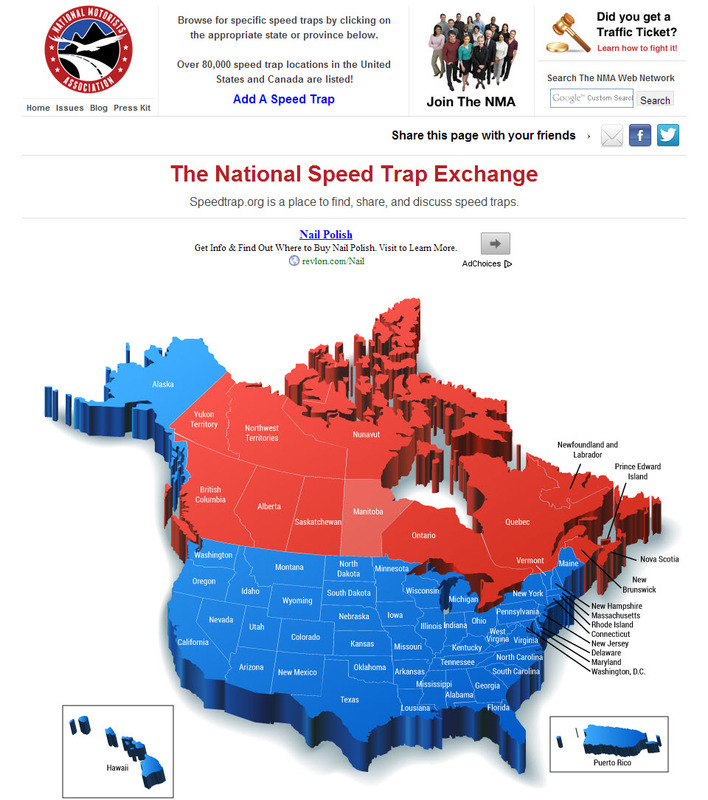 The National Speed Trap Exchange is part and parcel to the NMA’s overall mission to help drivers. It is also a very important platform for our advertising clients. Those two realizations made our decision to update the site a no-brainer. This may be the only time you will ever hear us support the need to drive traffic levels higher and higher. The first, and most apparent, update to the Exchange is the user interface. Figure 1 shows the familiar list-based interface of the past several years. The navigation process was very basic: Pick a state or province, then pick a city from another list, and then view all the reported speed traps for that community in reverse chronological order. The community speed trap pages remain the same, as does the procedure to add comments or a new speed trap location, but the path to those pages is much more dynamic now. The new home page of the Exchange is shown in Figure 2. The colorful 3D map of the United States and Canada signals the primary upgrade, from a list-based to a map-based navigation process. Hover over a state or province with the mouse cursor to highlight that territory and then click to go to a state/province map (Figure 3) where cities can also be selected with mouse clicks. The result is a more efficient and more geographically interesting means of finding speed trap reports for a given community. Because the state maps cannot possibly show all of the speed trap communities, the site visitor can opt to see a full list of those communities that is virtually identical to that from the previous version of SpeedTrap.org. The map interface is not the only upgrade to the site. 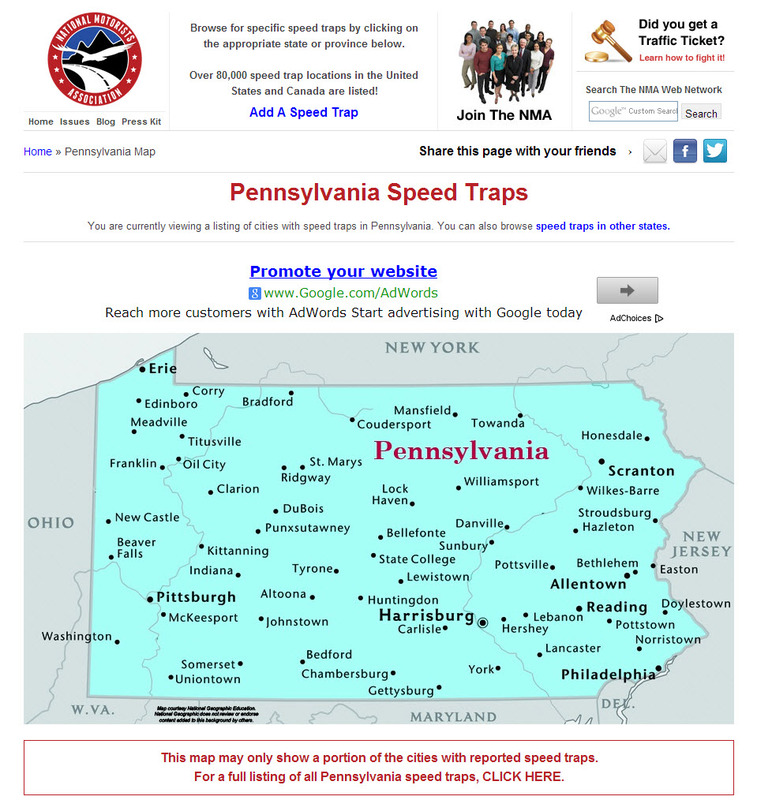 In order to promote a stronger NMA brand recognition, the header content of each page of SpeedTrap.org has been redesigned to look very similar to that of the NMA’s primary website at www.motorists.org. 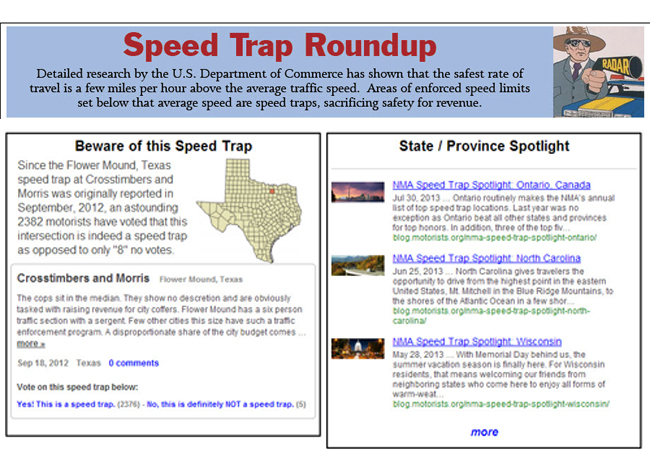 Not shown in Figure 2 is a new home page feature named the Speed Trap Roundup which will be updated with fresh content on a regular basis to give our followers and speed-trap groupies a reason to come back to the site frequently. The Roundup (see Figure 4) will appear just below the main map on the home page and will consist of two sections. The first is Beware of this Speed Trap which will highlight a particularly egregious speed trap location or speed trap city. (Flower Mound, Texas, come on down! You have the dubious honor of being the first of the worst.) The other part of the Roundup will be our State/Province Spotlight, providing convenient links to descriptions of speed trap activity in particular regions. This is a feature that we have been running on the NMA Blog for the past several months, providing valuable cross traffic between our most popular web pages. The Spotlight will include the links to our most recent articles, like this one featuring North Carolina. We will be promoting the upgrades to the NMA National Speed Trap Exchange aggressively in the coming weeks, including a national press release this week in advance of the Labor Day holiday. We hope you take a few minutes to check out the revamped Exchange at www.speedtrap.org and let us know what you think.